When Olga Ramirez and Guilibaldo Rosales received a five-day eviction notice Friday from the home they’ve lived in for nearly 12 years, they had no idea USC was partly responsible for their misfortune. It wasn’t until their neighbor, Lisa Pulgarin, brought them to an informal tenants’ rights workshop Monday that they learned about USC’s widespread role in gentrification and rising housing costs. The workshop was held by USC Forward and other local organizations that are spending the week protesting USC’s displacement of local communities as a result of the University’s expansions into East and South Los Angeles, among other issues. Through the workshop, Ramirez, 45, and Rosales, 46, were able to meet with Noah Grynberg, an attorney from the Los Angeles Center for Community Law and Action. Ramirez and Rosales said meeting with Grynberg gave them hope for their future at 28th and Maple streets and that they plan to meet again Tuesday to discuss the details of their case. Grynberg said that while LACCLA works with organizations that have dealt with USC in the past — like the Alliance of Californians for Community Empowerment, which was present Monday — his organization was only introduced to problems like those facing Rosales and Ramirez about a month ago. He said that because LACCLA primarily operates in East Los Angeles, he hasn’t worked with people impacted by evictions and gentrification around University Park Campus. But as the Health Sciences Campus doubles down on its 25-year plan to expand by over 3 million square feet into the surrounding Boyle Heights neighborhood, he expects to see more cases like that of Ramirez and Rosales. Grynberg emphasized the importance of local residents using their political power to push back against the University, but said change could take months or even years. Multiple organizers told the crowd USC could lessen the effects of gentrification in the surrounding communities by lobbying for tenant protection, providing more on-campus housing for students and engaging with tenants face-to-face. René Christian Moya, director of Housing is a Human Right — the housing advocacy division of the AIDS Healthcare Foundation — led a discussion with event organizers and local residents about the causes of displacement and gentrification. 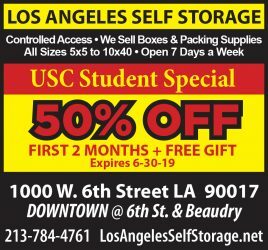 Moya said he views displacement around USC’s campuses as part of a broader issue pervading the United States in the last 30 years, in which the growing appeal of urban environments has raised rent prices and pushed local residents out of homes they can no longer afford. Moya emphasized the differences between USC and universities like UCLA and Stanford, which, unlike USC, are not located in primarily non-white, lower class neighborhoods. 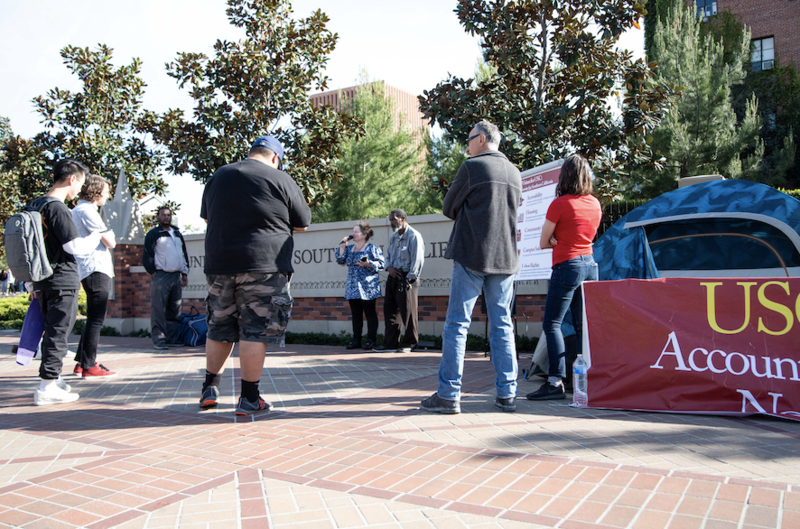 Earlier in the day, nearly 30 protesters from USC Forward, ACCE and other organizations discussed their experiences with eviction and gentrification and what solutions they expect USC to implement moving forward. 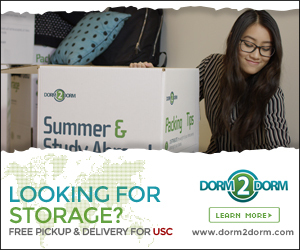 Jackelin Lopez lived on Exposition Boulevard for seven years before getting evicted after the building’s new owners decided to renovate it for USC students. While she was able to find a new home in Mid-City, she said it is smaller and more expensive. Since she moved, the building has been remodeled and cleaned. It was infested with cockroaches while she lived there. She also said that the rent for her old apartment before leaving had tripled. Lopez said she will continue speaking out to help people in the community find affordable housing options. She encouraged people to continue pushing for reform and legislation around equitable prices and just housing conditions. Veronica Castillo, a tenant from East L.A., was told in 2017 that she would need to leave her home by 2020 so that the building could be turned from low-income housing into student housing. The landlord told her she could only stay if she was willing to pay $2,800 each month — an increase of about $1,300. 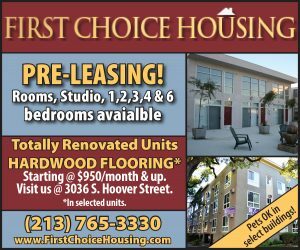 When she went door-to-door talking to neighbors about fighting the evictions and asked for help from LACCLA lawyers, she faced pushback from the landlord, who reduced her parking spaces and accused her of various violations. Moya also spoke about the Anti-Tenant Harassment Ordinance, a bill that he said is still being reviewed by the Los Angeles City Council. He said landlord-tenant harassment exemplifies some of the auxiliary effects of unregulated gentrification, which USC has the ability to mitigate. Sergio Vargas, the District 9 organizer at ACCE, told stories of other local tenants who couldn’t make it to the event, but are also being pushed out of their homes due to increasing rents and poor living conditions, including mold and insect infestations.